At 5:30am on June 4 more than 20 000 women and men, people from all walks of life, will meet before dawn at the Durban City Hall to be part of this year’s Comrades Marathon. When they set off on the 86.7 kilometre run to Pietermaritzburg they will become part of one of the great events in world sport. The Marathon has changed dramatically since its inception as a colonial event on Empire Day in 1921, when only white men were permitted to participate. Born out of World War One, Vic Clapham, a soldier who had fought in then German East Africa, now Tanzania, had a vision for the Comrades Marathon: a race commemorating the lost lives of white South African soldiers. Black people and women were only officially allowed entry in 1975 after a struggle in the media exposed the race’s exclusionary rules. Even then, apartheid’s oppressive laws meant that while anyone could participate black and white runners had to use separate amenities. In 1923, despite having her entry officially denied, Frances Hayward, a typist from Durban, became the first woman to compete and to complete the race. 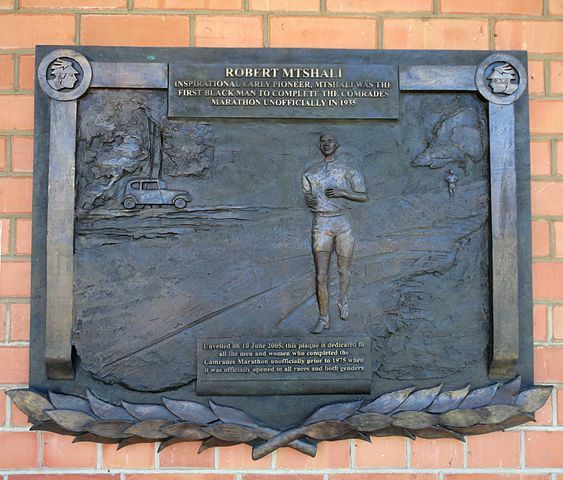 Black people also ran unofficially in violation of racial segregation laws and Robert Mtshali was the first Black person to complete the race in 1935 — his feat, like that of others who followed, was not officially recognised. For these athletes, running was an act of personal and public defiance. In 1976, he finished 20th, gaining one of his 14 silver medals. South Africa is not the only society in which running, an act of elemental personal freedom, has been subject to organised brutishness of oppressive bureaucracies. In 2016 Iran held its first marathon: I Run Iran, an exclusively male event. Its slogan declared: Real Men Run Iran. This did not deter women athletes, Masoumeh Torabi and Elham Manoocheri from running in protest. Opposition to gendered discrimination in running can be traced back to Stamata Revithi’s intervention as the first woman to complete the 1896 Olympic marathon in Athens. Despite being denied participation, Revithi ran the marathon a week later as an act of defiance against the exclusively male event. She procured a list of signatures of witnesses to prove to the organisers that she finished within the top percentile. In 1967 Kathrine Switzer became the first woman to officially participate in the 1967 Boston Marathon. Two miles in, a race organiser attempted to forcibly remove Switzer from the course. The moment radicalized Switzer into becoming an activist for female runners. By the 1980s the Comrades Marathon was a major public event in South Africa, with something of the spirit of the Carnival in the towns along the route. The courage and tenacity of otherwise ordinary people was an inspirational event, in which all South Africans could and did participate. The race came to be a public event that was widely understood as a potent, albeit implicit, condemnation of the society around it. This was enhanced by the fact that legendary nine times winner, Bruce Fordyce, was a committed anti-racist. In 1989 Samuel Tshabalala and Frith van der Merwe, two phenomenal runners, made new breaches into a history of oppression. Tshabalala became the first black person to win the Comrades Marathon and Van der Merwe ran a staggeringly fast time, finishing 15th overall. Her down run gold record of 5:54:43 still stands today. When she moved to the South Coast to teach at Port Shepstone Senior Primary School in the ‘90s she joined Gono’s club, South Coast Striders. Willie Mtolo, a two-time Comrades runner up, won the 1992 New York Marathon after the lifting of the international sports boycott. His visit to New York put phuthu into the pages of the New York Times, and world running history. While Mtolo was using a primus stove to prepare his pre-match meal smoke detectors in the New York Hilton were triggered, and the building evacuated. Another teacher, Farwa Mentoor from Mitchell’s Plain, Cape Town became the first woman and person to achieve ten gold medals in the Comrades. In an interview with Athletics Clipboard, Mentoor recalls how the ghost of apartheid still haunted her first Comrades Marathon in 2002: “I was an A-seeding runner and as such I was to start the race at the front of the field of runners. A marshal, a white lady, did not want me to go to the front of the field, which resulted in an altercation. With the help of former teammates in the Sacos [South African Council on Sport, a radical sports organisation that ran black sports during apartheid], I was able to get to the start of the race. This altercation, a racist one, wasn’t ideal as this was my first Comrades for which I qualified in every sense of the word.” Mentoor’s protest against her experience highlights racism’s continuing presence in sport. A different kind of record was set by brothers Andrew and Gift Kelehe who each won the race 14 years apart, marking a first for siblings in the race’s history. Both are policemen from Mafikeng, in the North West Province. It has been reported that Gift Kelehe may have plans to defend his 2015 title in 2017. Today there are still people who are excluded from the race as a result of the cost of entrance fees and sporting gear. But running remains a relatively low cost sport in which grit and determination still count for more than money. It remains one of the most democratic sports. On Sunday millions of people will watch the race, along the route or at home on television. These days the Comrades Marathon is an international event – the unofficial world championship of ultra marathon running. The race is now a world apart from its colonial origins. It has become an event where overt struggles against racism, gender discrimination and class exclusion intermingle with the human love for the physical, mental and spiritual endurance the sport demands. This rich admixture of defiance and sporting camaraderie has made the Comrades Marathon a great and inspirational event in the world of sport, that is continually remaking itself in relation to the world it occupies.